Dia de Locos, The Craziest Parade Ever! 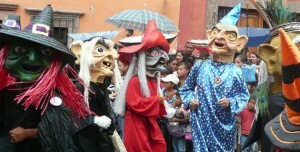 Día de los Locos takes place on the Sunday closest to June 13, St. Anthony’s feast day. St. Anthony is the saint you beseech to find anything lost, including people. Though the flamboyant procession of costumes and masks of politicians, actors, cartoon characters and monsters would seem to be totally secular, this complex festival has deep religious roots. At one time, a monk was responsible for keeping birds out of the order’s orchard here in San Miguel. He played music and danced wildly to keep the birds away. However, on St. Anthony’s feast day he wanted to attend mass and left the orchard unattended. In apparent respect, the birds stayed away. For 8 to 15 days residents visited a different house to view their altar to Saint Anthony and enjoy a meal. Then the faithful entered the Church of Saint Anthony on their knees. Saint Anthony was beseeched by single women in search of a boyfriend or groom. If her prayers were unheeded the woman would remove the baby Jesus from the St. Anthony’s statue’s arm only to be returned upon the presentation of the requested man. By the early 1700’s, scarecrow carrying gardeners danced and played music on clarinets and tambourines in a parade for Saint Anthony. At this time the custom of cross-dressing started along with carrying skunks and squirrels which earned the gardeners the nickname, the locos. The Viceroy of New Spain, Don Juan de Acuna, Marquis de Casafuerte, prohibited the celebrations of the locos with 200 lashings, a 200 peso fine and a three month stay in jail for the indigenous. Today locals kept up the tradition of music, large dolls and wild dancing with men dressed as women, women as men, clowns as nuns and anything else that can be imagined. It truly is a day to go wild making fun of the political and famous! The large dancing dolls (Las Mojigangas) were originally handcrafted by the indigenous as a sarcastic tribute to the rich Spanish who were their captors. The various neighborhoods each have their own locos group performing that day with most carrying an image venerating Saint Pascal and/or Saint Anthony. The day begins with a huge outdoor mass at the San Antonio church where the priest reminds the congregation that dressing up for the day to be free to celebrate one’s faith is not only necessary, but liberating from life’s daily tasks. From there the string of marchers, floats and dancers heads to centro, tossing candy at the crowd along the way. Crowds are dense so if you make your way into centro, don’t expect to get out again until the parade is over hours later. Today is arguably San Miguel’s largest tourist day.